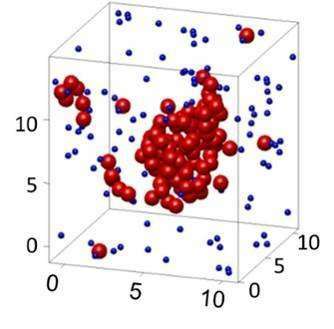 Figure 1: A liquid nucleus, observed using model particles serving as atoms. The red spheres indicate liquid-like particles, while the blue spheres indicate gas particles. This nucleus was observed to be just large enough to be stable and grow. Axis labels indicate distances in micrometres (one millionth of a meter). Credit: P. Schall et al. Researchers from the UvA's Institute of Physics (IoP) and Leiden University have found a new way to visualise and measure the nucleation process responsible for the formation of liquid droplets in vapour. Their findings, published this week in Physical Review Letters, improve our understanding of the nanoscale processes underlying the nucleation of liquids, and help to develop more accurate models of nucleation in fields from nanoscience to atmospheric science. Nucleation is the initial step in the formation of a liquid from its vapor phase. Think of the formation of clouds occurring when tiny water droplets suddenly form from the water vapour that the air carries. These minutest droplets, which kickstart the condensation process, are called 'nuclei' – though they should not be confused with the nuclei of individual atoms – and their role in starting the liquid formation is crucial to atmospheric processes, catalytic reactions and industrial processing. The effect of nucleation is well known in daily life. Everybody is familiar with the sudden splashing of water when opening a bottle of sparkling water after it has been shaken during travel or transport. The effect can be dramatically accelerated in the famous Diet Coke-Mentos experiment. A piece of Mentos candy added to a bottle of Diet Coke leads to an explosion-like spill of the beverage. This splash comes from the sudden nucleation of gas (carbon dioxide) which is dissolved in the beverage at a concentration that is 'too high' – that is, higher than its saturation level. Under normal circumstances, nucleation limits the pace of this process, as it requires initial tiny gas bubbles to form. Creating the surfaces of these gas bubbles in the liquid costs energy: the so-called surface tension. However, adding impurities or rough surfaces to the liquid reduces this nucleation energy substantially, thus accelerating the nucleation process dramatically. Because the particles are about ten thousand times larger than atoms, they can be imaged conveniently in three dimensions, giving rich, direct insight into atomic-scale processes in the states of matter, as well as the transitions between these states. By increasing the attraction between the particles, the researchers were able to condense them from a gas to a liquid state. Conversely, they could 'evaporate' the condensed liquid state back into the gas state by lowering the attraction. Observing these processes in a microscope, they were able to follow the developing nucleation process with unprecedented detail and managed to obtain three-dimensional images of initial stable nuclei, as shown in Figure 1. The researchers then carefully monitored the shapes of the nuclei and from the distribution of shapes could measure their surface tension, the crucial quantity determining nucleation that had been inaccessible to experiments so far.